Ex-Scientologist Peter Letterese has found a nice way to get attention for his lawsuit against the Church of Scientology for $250 million, claiming the Church is a "crime syndicate" that needs to be broken up under RICO statutes: he's added Tom Cruise as a defendant. Investigator Paul Barresi, who says he has done investigative work on behalf of Cruise, provided the NY Daily News with court papers from the Florida District Court lawsuit that show how members of the Church allegedly harassed Letterese after he left. 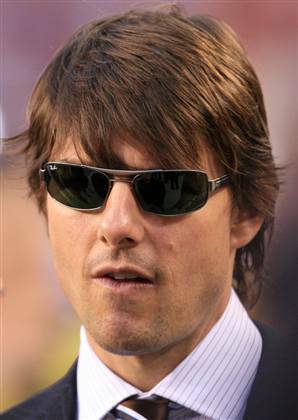 The papers allege that Cruise acted as Scientology head David Miscavage's "right-hand man for foreign and domestic promotion, as well as for foreign and domestic lobbying. He has assisted the syndicate in acquiring funds and [made] his own donations of money believed to be in the multiple tens of millions of dollars." Gawker wonders if Cruise and his team should have better taste in investigators, pointing out Cruise lawyer Bert Fields' infatuation with Anthony Pellicano and now Cruise's connection to Barresi, who apparently is blabbing to Daily News gossip columnists. » Generic zoloft. from Zoloft guy. » Phentermine adipex same day delivery. from Adipex. » Cialis levitra viagra. from Cialis.